If you want the beautiful looks of naturally good looking floors but need something durable and easy to maintain, then take a look at our luxury vinyl flooring collection. At Callahan’s Carpet One Floor & Home we carry all kinds of flooring, including luxury vinyl that fits the needs of you and your home. Luxury vinyl is quickly rising in popularity in the flooring market and for good reason. Read below to learn about the benefits of luxury vinyl. To begin with, luxury vinyl is made to look and feel just like real hardwood, stone, or tile flooring. Using the most up-to-date printing technology and registered embossing, luxury vinyl is becoming the new alternative to hardwood and other natural flooring. Choose to stay on trend with weathered rustic looks, or lean towards more traditional warm tones, luxury vinyl comes in endless options. In addition to its ability to imitate other flooring, luxury vinyl also has other beneficial features. Luxury vinyl is made with a special backing that makes it feel softer underfoot than hardwood or stone. It is also much warmer feeling than a traditional tile or wood floor. The surface of luxury vinyl is made to be scratch and scuff resistant, and some variations of luxury vinyl are water resistant and even water proof. Luxury vinyl is also known to be much easier to install and even easier to clean and maintain. That means you get more time to do the things you love. Be sure to visit our Callahan's Carpet One showroom in Hudson, OH., and speak with a flooring expert about installing luxury vinyl floors in your home. Learn about our available luxury vinyl flooring brands. What is Luxury Vinyl Tile? 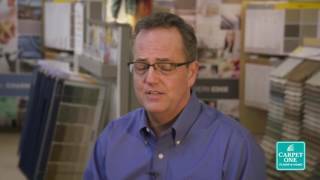 Join our very own Jim Aaron for some inside information on the Luxury Vinyl Tile. This growing category of flooring has great features and benefits that could be perfect for your home. Wood look is a growing category in luxury vinyl, and it’s staying on trend. Get all of your favorite features of hardwood but with the added benefit of it being vinyl. Learn about the types of luxury vinyl floors available at Callahan's Carpet One, and the installation process. Learn about sheet vinyl, rigid core, and WPC flooring.